A boisterous crowd of 100,000 people poured on the chilly sidewalks in 5th Avenue Tuesday, cheering Dennis Conner and his Stars & Stripes team on a 13-block ticker tap parade. The parade, paid by real estate magnate Donald Trump, was the last public event in the four-day American victory lap that started on Saturday when Conner triumphantly returned from Australia with the Americas Cup, the Holy Grail of Sailing. 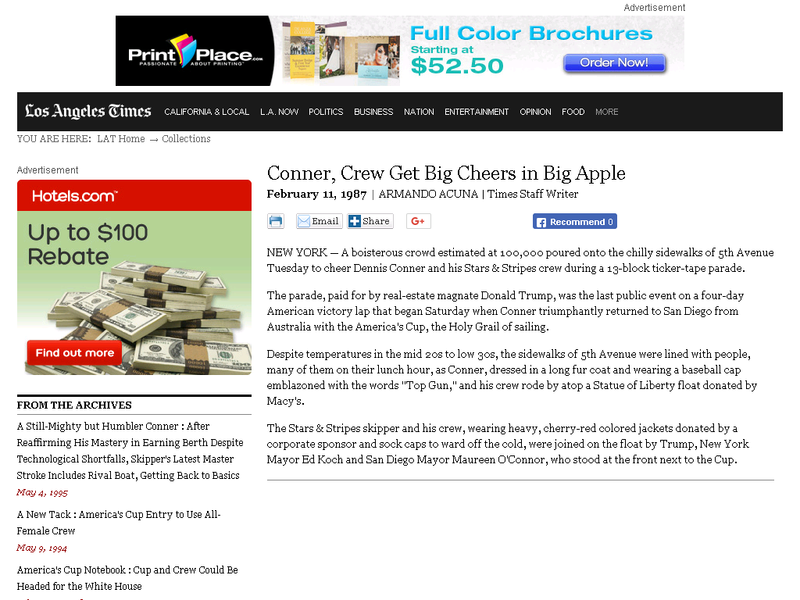 Despite temperatures between mid-20s and low 30s, the sidewalks on 5th Avenue were lined with people, many of them at lunch time, Conner wearing long fur coat and a baseball cap emblazoned with the words “Top Gun,” and his crew rode on top of a Statue of Liberty float donated to Macy’s. The Skipper and his crew, wearing heavy, cherry-red jackets donated by a corporate sponsor and the sock caps to keep the cold off, were joined in the float by Trump, New York Mayor Ed Koch, and San Diego Mayor Maureen O’Connor, who stood on the front next to the Cup.